Mark Blaug in his influential book The Methodology of Economics (2nd edn. ; 1992) dismissed Ludwig von Mises’ later methodological work and apriorist praxeology as “so idiosyncratic and dogmatically stated that we can only wonder that they have been taken seriously by anyone” (Blaug 1992: 81). This statement provokes outrage from some Austrians, but Blaug was stating a simple truth. Praxeology – Mises’ method for economic science – is based on a false and intellectually bankrupt Kantian epistemology requiring synthetic a priori knowledge. Modern analytic philosophy rejects Kantian epistemology and synthetic a priori knowledge, and for good reason. All alleged examples of synthetic a priori knowledge – such as mathematics or Euclidean geometry – have turned out not to be at all, and the same can be said for Mises’ “human action axiom,” which is supposed to be the basis of praxeology. The “human action axiom” is is quite clearly synthetic a posteriori, and Mises himself made a candid and embarrassing admission to Israel Kirzner that contradicts his earlier views on epistemology. In fact, there is strong evidence that Mises was a wretched philosopher, and that he was simply confused about the difference between “synthetic” and “analytic” propositions. The utter failure of Mises’ epistemology can be seen in the challenge that George J. Schuller made to Austrians in 1951 in his review of Human Action. 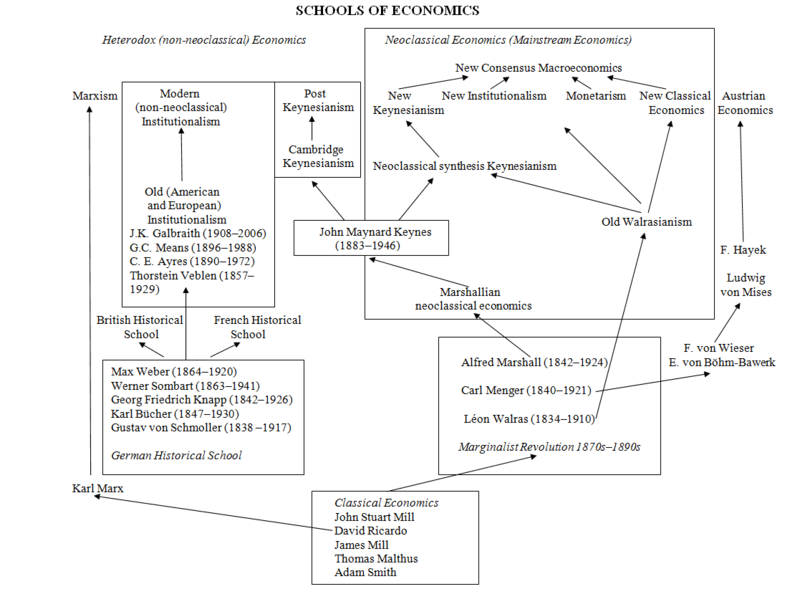 Schuller pointed out that, if the economic theories of Mises’ book Human Action really are derived by painstaking and valid deductive argument, then it should be possible to set the book out in a formal symbolic form in which all axioms, premisses, and deductions are shown formally and proven. No Austrian has ever done this. Their failure to meet Schuller’s challenge is pretty strong proof that Mises’ praxeology was a house built on sand. And what of Mises’ wider influence on this subject? Outside the fringe Austrian school, virtually nobody takes Mises’ praxeology seriously. Mark Blaug was entirely correct. “Deduction, Necessary Truth and the Real World,” March 16, 2014. Blaug, Mark. 1992. The Methodology of Economics, or, How Economists Explain (2nd edn.). Cambridge University Press, Cambridge, UK. The issue of the role of the German government budget deficit in the hyperinflation is controversial. 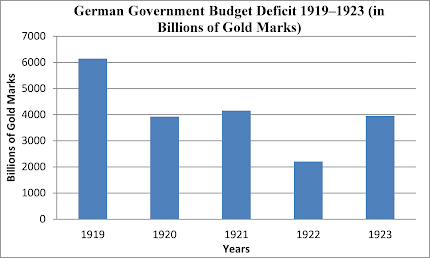 Above all, what was the role of the budget deficits in 1919, 1920 and 1921? We can see the size of the deficit in the graph below (with data from Eichengreen 1995: 138, Table 5.1). As we can see, the deficit of 1919 was large (larger than that of 1923, the worst year of the hyperinflation), but from 1920 to 1922 – apart from a small rise in 1921 – there was a clear falling trend. This was caused by the recovery of the German economy and by the tax reform of Matthias Erzberger passed in 1919. The falling deficit was actually a cause of increased confidence in the German economy at the time. If the large deficits were the primary cause of the hyperinflation, then one must wonder why hyperinflation did not occur earlier in 1919 or 1920. “This [sc. crisis of confidence] came to a halt in the spring of 1920 as conflict between domestic political factions diminished, increasing imports improved living conditions, industrial production began to grow and, in March 1920, the Erzberger tax reforms were enacted. ‘[I]t seemed that a certain faith in the mark was again established among the German population.’ Confidence and optimistic expectations about the future value of the mark remained dominant until the London Ultimatum of May 1921. Prices remained broadly stable, despite the continued growth of the nominal quantity of money… .” (Holtfrerich 1986: 190). Given the falling deficit, the tax reform, the prospects for budget balancing, and the hope that the final reparations burden would be more realistic than the initial proposed figure, the evidence would suggest that there really were grounds for confidence in the mark from 1920 to May 1921 (Webb 1989: 54; see also Burdekin and Langdana 1995: 93). 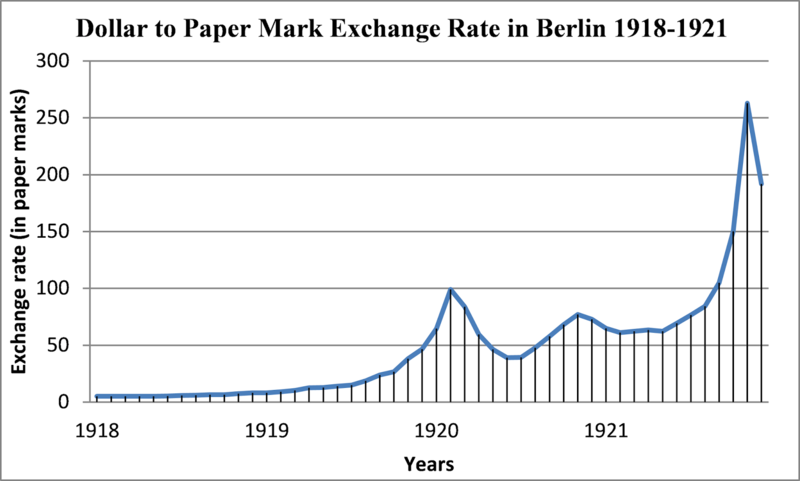 The return of a relative stability in the dollar–paper mark exchange rate in 1920 and early 1921 can be seen in the graph below (with data from Feldman 1993: 5, Table 1). As we can see, by early 1921 the mark’s value had stabilised in terms of dollars. Then after the May 1921 London Ultimatum the catastrophic depreciation began, which was a fundamental driver of the hyperinflation. 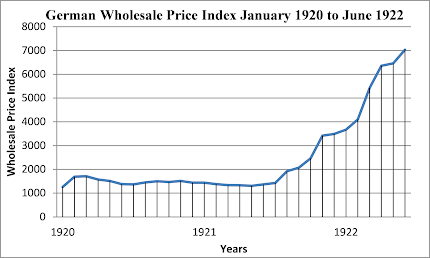 It was only after May 1921 and the currency depreciation that run-away inflation occurred as well, as we can see in the German wholesale price index graph below (with data from Burdekin and Langdana 1995: 108, Table A5.1). A further really catastrophic shift in domestic expectations about, and confidence in, the mark appears to have happened after June 1922 when the mark lost its role not only as a store of value but also as a unit of account (Holtfrerich 1986: 70), but this is perfectly consistent with the view that it was the accelerating currency depreciation beginning in late 1921 that was the fundamental driver of the hyperinflation. Burdekin, Richard C. K. and Farrokh K. Langdana. 1995. Confidence, Credibility, and Macroeconomic Policy: Past, Present, Future. Routledge, London and New York. Feldman, Gerald D. 1993. The Great Disorder: Politics, Economics, and Society in the German Inflation, 1914–1924. Oxford University Press, New York. Holtfrerich, Carl-Ludwig. 1986. 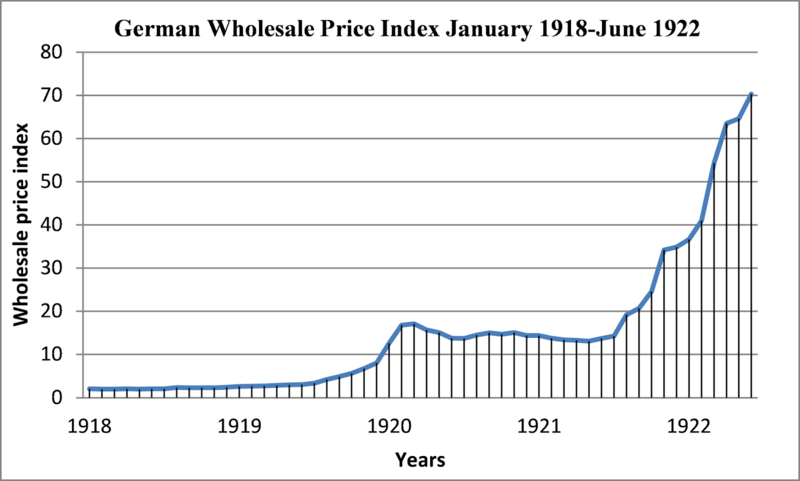 The German Inflation 1914–1923: Causes and Effects in International Perspective (trans. Theo Balderston). De Gruyter, New York. Webb, Steven B. 1989. Hyperinflation and Stabilization in Weimar Germany. Oxford University Press, New York. (6) Journal of Economic Issues. Of course, a number of these journals also publish work in other heterodox traditions, such as non-neoclassical institutionalism and Marxian economics, in addition to Post Keynesian economics. Most probably, I have missed important ones, and am happy to receive suggestions and additions. For example, are the Review of Social Economy and Science and Society venues for Post Keynesian economics too? (they are listed as heterodox journals in Lee 2009: 47). Joan Robinson’s review of Costantino Bresciani-Turroni’s The Economics of Inflation (The Economic Journal 48.191 : 507–513) contains Robinson’s views on the causes of the Weimar hyperinflation. (3) a Post Keynesian “balance of payments” theory but emphasising endogenous money and wage and price versus foreign-exchange spirals. Joan Robinson (1938) formulated this on the basis of the earlier “balance of payments” view. First, it is necessary to stress what the argument is not about. The argument is not about whether money supply exploded in Weimar Germany or whether the Weimar government ran a huge budget deficit in 1923 that was funded by central bank money creation (or monetising of the deficit). Nor, as far as I can see, do Post Keynesians dispute that a sustained general increase in prices or hyperinflation requires a growing money stock to sustain it. But, while a money supply expansion is a necessary condition for this, what is being disputed is whether exogenous money creation was the primary causal factor. The alternative view is that money creation can be seen largely as endogenous and a type of intermediate, though necessary, cause driven by other factors. 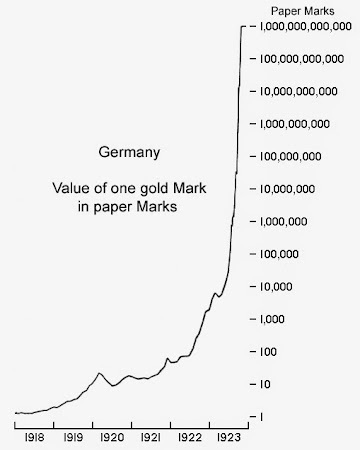 The “balance of payments theory” argues that the severe depreciation of the German mark was the fundamental causal factor in the hyperinflation, and that in turn was driven by the burden of the reparations imposed on Germany. We can see how the Post Keynesian view contradicts the “quantity theory” view by looking at how both sides understand the causality involved in the hyperinflation. exogenous money supply → price inflation → the exchange rate depreciation. The Post Keynesian view rejects this, and the depreciation of the mark is seen as the fundamental causal mechanism. the exchange rate depreciation → price and wage inflation → inflation of money supply. How does Robinson’s review fit into this? 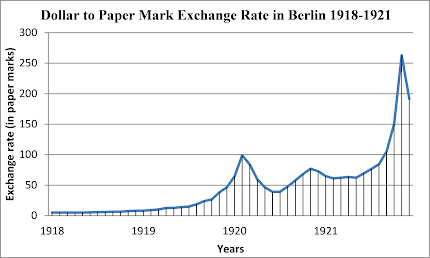 First, Robinson noted that the facts seem to support the “balance of payments view”: the severe inflation that hit Germany in the later half of 1921 was preceded by the severe depreciation in the exchange value of the mark from May 1921 to November 1921 when the German government began paying large cash reparations payments (Robinson 1938: 507–508). “If the impulse comes from the side of the exchange, we should expect the fall in exchange to run ahead of the rise in prices, and the prices of traded goods to run ahead of home prices. This is precisely what occurred, the magnitude and speed of change being in this order: exchange, import prices, export prices, home prices, cost-of-living, wages. Moreover, the geographical diffusion of prices supports the argument, the movement spreading from the great ports and commercial centres to the interior of the country.” (Robinson 1938: 508). Next, Robinson notes that the proponents of the “quantity theory” explanation of the hyperinflation like Bresciani-Turroni argued that this cannot be the case, because the tendency to balance of payments equilibrium would have prevented this, and that it was the German budget deficit financed by Reichsbank money creation that was the primary cause of the hyperinflation (Robinson 1938: 509). “The missing item is not far to seek. It is the rise in money wages. Neither exchange depreciation nor a budget deficit can account for inflation by itself. But if the rise in money wages is brought into the story, the part which each plays can be clearly seen. 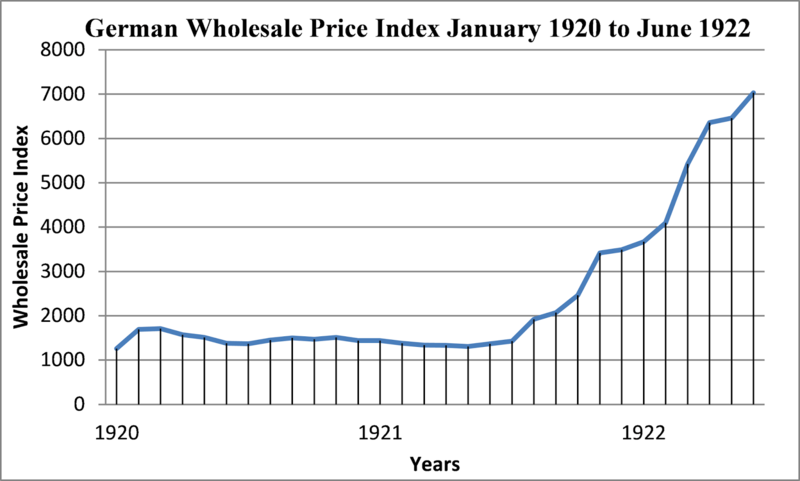 With the collapse of the mark in 1921, import prices rose abruptly, dragging home prices after them. The sudden rise in the cost of living led to urgent demands for higher wages. Unemployment was low …, profits were rising with prices, and the German workers were faced with starvation. Wage rises had to be granted. Rising wages, increasing both home costs and home money incomes, counteracted the effect of exchange depreciation in stimulating exports and restricting imports. Each rise in wages, therefore, precipitated a further fall in the exchange rate, and each fall in the exchange rate called forth a further rise in wages. This process became automatic when wages began to be paid on a cost-of-living basis … . Thus … [Bresciani-Turroni’s] contention that the collapse of the mark cannot have caused the inflation, because the exchange rate will always find an equilibrium level, is deprived of all force as soon as the rise of money wages is allotted its proper role. …. Without rising money wages, inflation cannot occur, and whatever starts a violent rise in money wages starts inflation.” (Robinson 1938: 510). 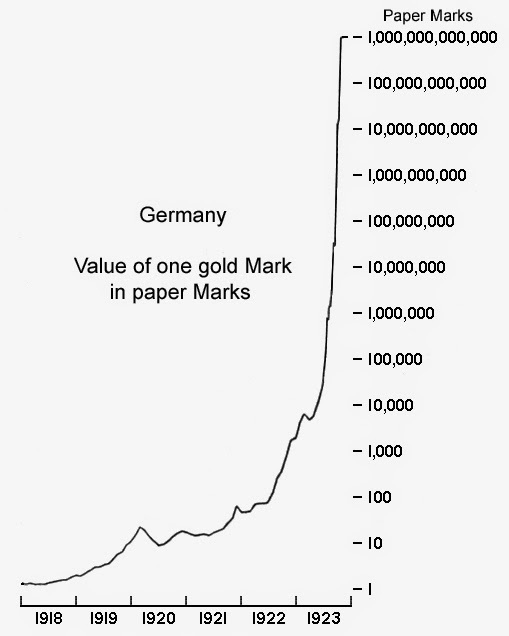 To the extent that the Reichsbank met the demand for high-powered money and loans from the private sector as wages and prices soared and there were also both official and unofficial “supplementary currencies” improvised during the course of the hyperinflation to meet demand for money (Robinson 1938: 511), then the explosion in the money supply was endogenous to a great extent. But even these observations do not lessen the role of (1) the exchange rate depreciation as the fundamental and primary causal driver of the hyperinflation and (2) the significant role that endogenous money creation played in the explosion of the money supply. 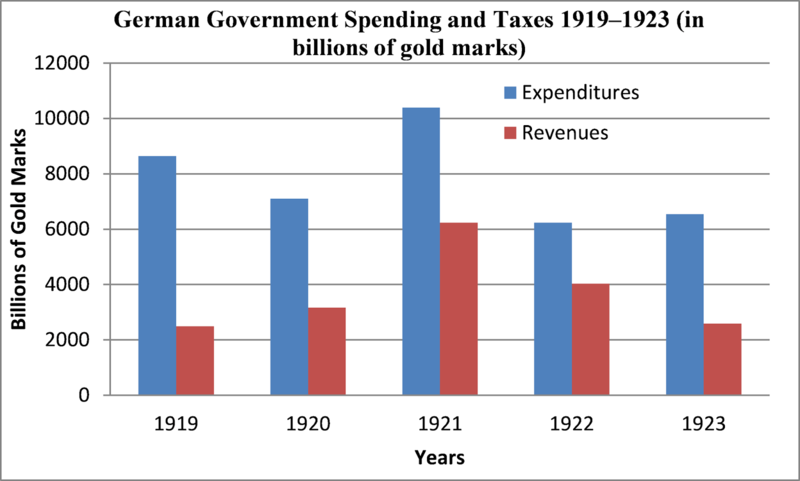 To gauge the role of the German government budget deficits in the period from 1919 to 1923, we can look at this graph below of German government spending and tax revenue (in billions of gold marks) (from Eichengreen 1995: 138, Table 5.1). As we can see, the hyperinflation was accompanied by a disastrous collapse of tax revenues, especially in 1923 when the deficit widened considerably. Government spending actually fell in 1922 and only rose slightly in 1923. 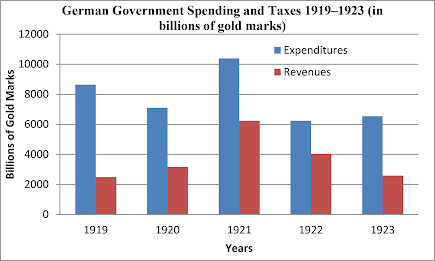 The major cause of the massive budget deficit in 1923, then, was tax revenue collapse, not massive increases in government spending. Another point is that budget deficits in 1919 and 1920 were very large, but inflation did not spiral out of control in these years even though it did rise appreciably (as seen in the second graph below). If such large budget deficits were the primary cause of hyperinflation, then why did it not begin earlier in 1919 or 1920? Why did it spiral out of control only after the currency depreciation? * And we can note that Joan Robinson (1938: 510), far from being some unreasonable dogmatist, was perfectly prepared to concede that excessively large budget deficits in periods of very low unemployment can initiate inflations, and that it is “even possible that an increase in the quantity of money might start an inflation” (Robinson 1938: 511), though that was not the primary cause of German hyperinflation. Matias Vernengo, “Inflation, Hyperinflation and Monetarist Perceptions about the Functioning of the Economy,” Naked Keynesianism, Monday, March 24, 2014. Eichengreen, Barry J. 1995. “The Legacy of Hyperinflation,” in Barry J. Eichengreen, Golden Fetters: The Gold Standard and the Great Depression, 1919–1939. Oxford University Press, New York. 125–151. Graham, Frank Dunstone. 1967 . Exchange, Prices, and Production in Hyperinflation: Germany, 1920–1923. Russell, New York. Robinson, Joan. 1938. Review of The Economics of Inflation by C. Bresciani-Turroni, The Economic Journal 48.191: 507–513. Williams, John H. 1922. “German Foreign Trade and Reparations Payments,” Quarterly Journal of Economics 36: 482–503. Bob Murphy discusses the inflation of the 1970s here. It is a perfect example of how Austrians are still mired in the false and misleading quantity theory of money, and all its mistaken assumptions. 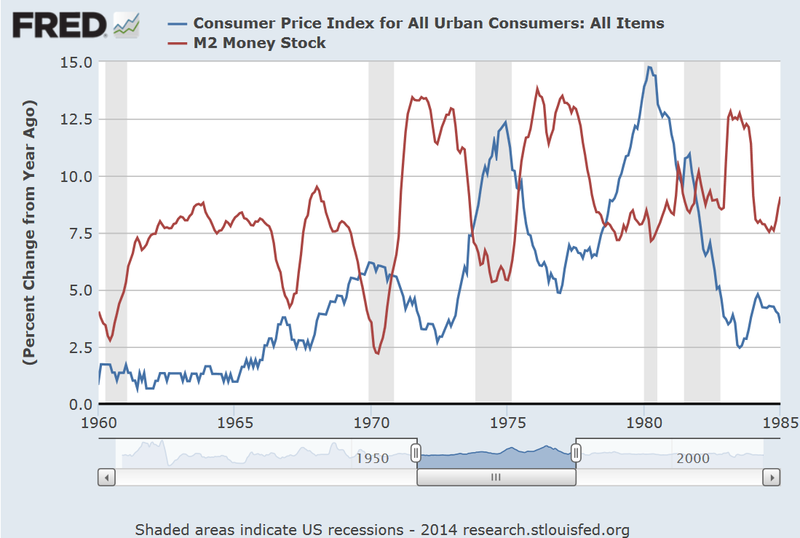 He uses the following graph (which can be opened in a separate window) showing M2 money supply growth rates with the CPI inflation rates. Furthermore, the supply shocks and wage-price spirals of the 1970s – the historically specific factors – cannot be ignored either. First, let us dispose of the quantity theory of money and explain endogenous money theory. Y = volume of all transactions in the value of national income. (1) prices are flexible and respond to demand changes in either (1) both the short and long run, or (2) at least in the long run. Related to this is a tacit assumption that the economy is near equilibrium in the sense of full use of resources and high employment, where stocks and capacity utilization are not fundamental methods that firms use to deal with changes in the demand for their products. (3) under the equation of exchange, for an increase in M to lead to a proportional increase in P, both V and T must be assumed to be stable. Under the Cambridge Cash Balance equation, M and P are causally related, if kd and Y are constant (Thirlwall 1999). (4) the direction of causation. The quantity theory assumes the direction of causation runs from money supply increase to price rises. So how realistic are these assumptions? (1) most prices are mark-up prices and relatively inflexible with respect to demand changes in both the short and long run. Most capitalist economies are far from full use of resources, and even in booms businesses make use of stocks and capacity utilisation to manage demand changes, rather than changes in prices. (4) the direction of causation. Under an endogenous system the direction of causation is generally from credit demand (via business loans to finance labour and other factor inputs) to money supply increases (Robinson 1970; Davidson and Weintraub 1973). credit demand → broad money supply increase → base money increase. (Moore 2003: 118). This is true, as noted above, since the money supply is endogenous: most of the money supply is “broad money” or bank money, and that is increased by credit expansion in the form of bank loans. (5) that money supply growth necessarily or generally induces direct and proportional changes in the price level is empirically false (De Grauwe and Polan 2005). 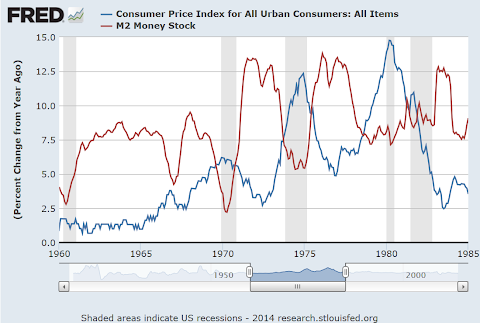 We can see here why broad money supply growth precedes inflation or real output changes. The reason is that (1) money is largely endogenous and (2) growth in the broad money supply is generally caused by credit growth. Many businesses finance their wage and other factor input bills with credit from banks, so that before real output grows money supply will grow. Cost-push inflation happens in the same way: when (1) workers or unions demand higher wages and businesses agree to these increases and/or (2) prices of other factor inputs rise, then businesses will need to obtain higher levels of credit from banks. Hence broad money supply growth rates rise, but this rise precedes price increases because businesses will generally raise mark-up prices to maintain profit margins at a later time, given that most firms engage in time-dependent reviews and changes of their prices at regular intervals. The process of a wage–price spiral involves actually this type of phenomenon, but in a vicious circle. Secondly, we need to understand mark-up pricing. Many businesses – and probably a majority in any given developed capitalist economy – set their prices mainly as a profit mark-up on total average unit costs (that is, fixed plus variable costs). Prices tend to change when total average unit costs change or when the firm wants to change its profit mark-up, and therefore supply costs are the important factor causing price changes (the overwhelming empirical evidence proving that mark-up pricing is prevalent throughout the developed world is here). Although demand-side inflation is a real and important phenomenon, it is not the only major cause of inflation. In fact, often demand-side inflation is a grossly overestimated cause of inflation and the really important cause is increases in mark-up prices by cost-push inflation: for mark-up prices are, generally speaking, not responsive to changes in demand (Kaldor 1976: 217). In the post-WWII world when unions were much stronger, collective bargaining in wages prevalent, and cost of living clauses standard in wage contracts, a sufficiently large rise in wages or spike in energy or raw materials costs could set off wage–price spirals, as businesses maintained their profit margin by simply raising their mark-up prices. Now we have sketched the two theories we need to understand inflation, in addition to demand-led inflation, we can turn to an actual explanation of the 1970s inflation from its origin in the late 1960s until 1975. The US saw a spike in inflation from October 1967 to February 1970. Then inflation turned around and, although high, inflation rates gradually fell right down to June 1972. This was preceded by a spike in M2 growth rates from January 1967 to January 1968. In the United States, unemployment had fallen to 3.8% in 1966 and 3.6% in 1968, historically low levels. Low unemployment led to some bidding up of wages in this period in the non-unionised sector. Unionised workers in turn also demanded higher wages. The inflation in the US, then, was driven by unusually higher wage demands (Kaldor 1976: 224), just as it was throughout other Western countries. As Nicholas Kaldor noted, around 1968–1969, similar types of wage rises occurred in Japan, France, Belgium and the Netherlands, and from 1969–1970 in Germany, Italy, Switzerland and the UK, which Kaldor attributed largely to trade union action (Kaldor 1976: 224). But then the US recession from December 1969 to November 1970 struck, and there was a marked decrease in inflation and M2 growth rates. From April 1970, acceleration in M2 growth rates began again and (as we would expect) preceded the recovery in real output that ended this recession. But M2 growth rates soared to a high level from April 1970 to July 1971, as the expansion in the business cycle occurred and higher wage demands continued. The momentous event that would set the stage for the inflation in the next phase was the end of the Bretton Woods system on August 15, 1971, when Nixon closed the gold window. The end of Bretton Woods was momentous: inflationary expectations and instability on financial and commodity markets resulted, as well as a rise in commodity speculation as a hedge against inflation. This contributed to the cost-push inflation that was being felt in many countries after 1971. Nevertheless, the end of Bretton Woods in August, 1971 did not suddenly unleash run-away inflation. As we see in the chart, US inflation rates continued to fall until June 1972. The spike in US inflation began again in June 1972 and continued until December 1974. (3) the first oil shock. Let us start with factor (1). In the late 1960s, the US began dismantling its commodity buffer stock policies that had previously ensured price stability in the golden age of capitalism. The prelude to stagflation was marked by a significant explosion in commodity prices that occurred in the second half of 1972. Part of the problem was the failure of the harvest in the old Soviet Union in 1972–1973 and the unexpectedly large purchases on world markets by the Soviet state (Kaldor 1976: 228). This could have been averted had the United States not dismantled its commodity buffer stock policies in the 1960s. As we have seen above, the end of Bretton Woods also induced commodity speculation and rises in commodity prices and raw materials costs. This feed into further price rises, which in turn exacerbated wage–price spirals. The final factor that explains the surge in inflation down to December 1974 was the first oil shock from October 1973, when various Middle Eastern producers of oil instituted an embargo that lasted until March 1974 (Kaldor 1976: 226). In most countries, the double digit inflation of the 1970s was caused by the oil shocks (both the first and second). This explains why M2 growth rates, while high, actually fell gradually from January 1973 to June 1974 as a recession struck the US from November 1973 to March 1975. This inflation was a supply-side phenomenon. The accelerating inflation rates from 1973 to 1974 occurred when the US economy was in recession and this anomaly puzzled many economists at that time. The new portmanteau word “stagflation” (stagnation + inflation) was increasingly used to describe the phenomenon, which meant the simultaneous occurrence of stagnation or recession (with high unemployment) and accelerating inflation. I have not bothered to continue this analysis down to 1980, but it could be easily done. The very same factors as described above also explain the second bout of stagflation and the major cause was the Second oil shock. Philip Pilkington, “Animism and Monetarist Thinking: The Inflation in the US in the 1970s,” Fixing the Economists, August 6, 2013. “US Inflation Rates (1946–1987), Keynesianism and Stagflation,” March 24, 2013. 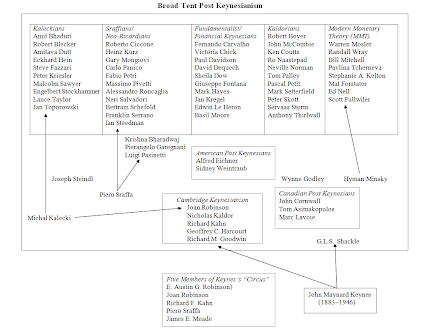 “Stagflation in the 1970s: A Post Keynesian Analysis,” June 24, 2011. De Grauwe, P. and M. Polan. 2005. “Is Inflation Always and Everywhere a Monetary Phenomenon?,” Scandinavian Journal of Economics 107: 239–259. Leo, P. 2005. “Why does the Velocity of Money move Pro-cyclically?,” International Review of Applied Economics 19.1: 119–135. Levy-Orlik, N. 2012. “Keynes’s Views in Financing Economic Growth: The Role of Capital Markets in the Process of Funding,” in Jesper Jespersen and Mogens Ove Madsen (eds. ), Keynes’s General Theory for Today: Contemporary Perspectives. Edward Elgar, Cheltenham. 167–185. Actually this subject bores me to tears, but here goes. Daniel Kuehn links here to a group of libertarians who seem to want to reclaim the word “liberalism” from “progressive” or “left” liberals and demand that it be restricted to “classical liberalism.” Why? Because the modern sense betrays the original meaning, or so the argument goes (though whether the broad range of opinions within Classical liberalism is even representative of modern libertarianism seems highly dubious, to begin with). This is rather like Austrians having a fit because the word “inflation” has evolved to mean “price inflation” rather than the earlier meaning of “monetary inflation” (for a debunking of that tired argument, see here). But, taken seriously, this argument would require that libertarians must abandon the word “libertarian” for their own political movement. We need only consult that wonderful resource, the Oxford English Dictionary (3rd. edn. 2010). In its earliest sense, the word “libertarian” seemed to have neither a political nor economic sense, but meant simply “a person who supports the view that human beings have free will” – as opposed to “necessarians” who denied free will (Oxford English Dictionary [3rd. edn. 2010], s.v. “libertarian,” sense A.1). The first cited use of the word in the Oxford English Dictionary is from 1789 (but of course that may not be the first instance of the word’s use in English). Therefore if one wants to take seriously the pedantic modern attempts to reclaim “liberalism,” one might just as well complain that modern “libertarians” have misappropriated the word “libertarian.” Therefore let us leave the word “libertarian” to the philosophers! Of course, this is an absurd argument. And it is not that we can’t abuse words, or that words cannot corrupt moral discourse, but that words change and develop over time, and anyone who demands that some word in our political or economic vocabulary must be restricted to its original or archaic meaning – as if they have some moral right to ban others’ use of language – is engaged in legerdemain. There has been a lot of discussion of the labour theory of value in the comments section lately, a view which, I think, most Post Keynesians reject, and rightly so. But Marx took the idea that labour is a measure of value and that labour is the cause of value from Ricardo (Robinson 1964: 36), and this idea in turn seems to stem from Adam Smith. But is there any hard empirical evidence from anthropology and history that this is true? For example, since hunters usually have different levels of skill and experience, and often success in hunting depends on luck, the hunting time for any particular animal caught could vary considerably. It is simply unclear to me why hunter-gatherers or hunter-horticulturists would have to determine exchange value in such a way, when labour time could vary to a significant degree on each occasion an animal is hunted, and it looks like Adam Smith is engaged in some speculation here that would need to be backed up with a great deal of evidence from anthropology to be taken seriously. Perhaps that evidence exists, but perhaps not too, like many hoary old myths in economics. I have not yet had a chance to look at the anthropological literature, and so will leave the question open. It was found that about 60% of firms review prices once a year, and around 50% only actually change prices once a year too (Fabiani et al. 2004: 21). (Fabiani et al. 2004: 14). So 48.5% of firms reported flat or decreasing unit variable costs: roughly half of firms surveyed. (Fabiani et al. 2004: 16). Mark-up pricing emerges as the overwhelmingly important type of price setting behaviour. It is also interesting here to see that regulated prices only account for only 13.3% of prices, which is far lower than the percentage for mark-up pricing. As I have argued here, it is a mistake to think from survey data like this that firms are only using unit variable costs to calculate their mark-up price. On the contrary, when firms are pressed on this issue and we look at all the other empirical evidence, it emerges that most mark-up pricing firms are using total average unit costs (including fixed/overhead costs). (Fabiani et al. 2004: 25). These results are in line with other national surveys, but the failure to include cost-based as a theory was a major oversight. Firms were also asked if a rise/fall in demand was an important factor in causing price changes, but some 51.1% of firms said demand changes were either unimportant (13%) or of minor importance (38.1%) in driving price changes (Fabiani et al. 2004: 26). Only 34% of firms said demand was an important factor. Most firms reported that cost shocks were the most important factor driving price changes (Fabiani et al. 2004: 27). Finally, price changes tend to be asymmetric: cost shocks are more likely to raise prices than reduce them (that is, firms often do not decrease prices if costs fall), and demand changes, to the extent they influence prices, tend to cause price decreases rather than price increases (that is, firms generally do not adjust prices upwards when demand increases but might reduce them if demand falls) (Fabiani et al. 2004: 34). I thought that Kalecki did not accept the labour theory of value, but Matias Vernengo raises a question about this in a comment here, and asks for the evidence. “Kalecki seems never to have declared himself in print as to where he stood in relation to the labour theory of value. He assumed that prices were fixed by firms according to their unit costs of production to which margins or mark-ups were added to secure certain levels of profit.” (Harcourt and Hamouda 2003 : 219). Chapple, Simon. 1994. “Kalecki’s Theory of the Business Cycle and the General Theory,” in John Cunningham Wood (ed. ), John Maynard Keynes: Critical Assessments. Second Series. Croom Helm, London. 538–559. Chapple, Simon. 2013. “Kalecki, Michał,” in Thomas Cate (ed. ), An Encyclopedia of Keynesian Economics (2nd edn.). Cheltenham, Edward Elgar Pub. 301–304. Hamouda, O. F. and G. C. Harcourt. 2003 . “Post-Keynesianism: From Criticism to Coherence?,” in Claudio Sardoni (ed. ), On Political Economists and Modern Political Economy: Selected Essays of G. C. Harcourt. Routledge, London. 209–232. King, John E. 2001. “Kalecki, Michał,” in Phillip Anthony O’Hara (ed. ), Encyclopedia of Political Economy. Volume 1. A–K. Routledge, London and New York. 607-610. Sawyer, Malcolm C. 1985. The Economics of Michał Kalecki. Macmillan, Basingstoke. Toporowski, Jan. 2004. “Kalecki’s Arguments for Socialism,” in Zdzislaw L. Sadowski and Adam Szeworski (eds. ), Kalecki’s Economics Today. Routledge, London and New York. 215–221. My revised diagram of the subgroups of Post Keynesian economics. In this version I have included Joseph Steindl and Kurt Rothschild amongst the Kaleckians. 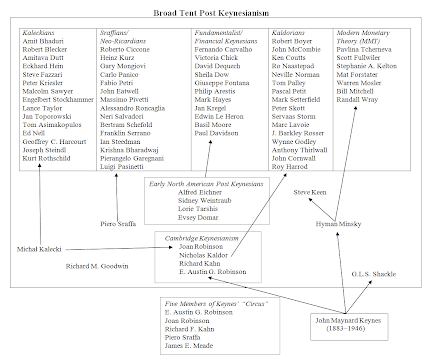 (1) is there a better way to classify the American Post Keynesians Alfred Eichner and Sidney Weintraub? (2) were James E. Meade and E. Austin G. Robinson Post Keynesians or did they basically remain neoclassical synthesis Keynesians? (3) where should Lorie Tarshis go? In light of the discussion below, I have updated the chart again. My final version of the chart (I hope! 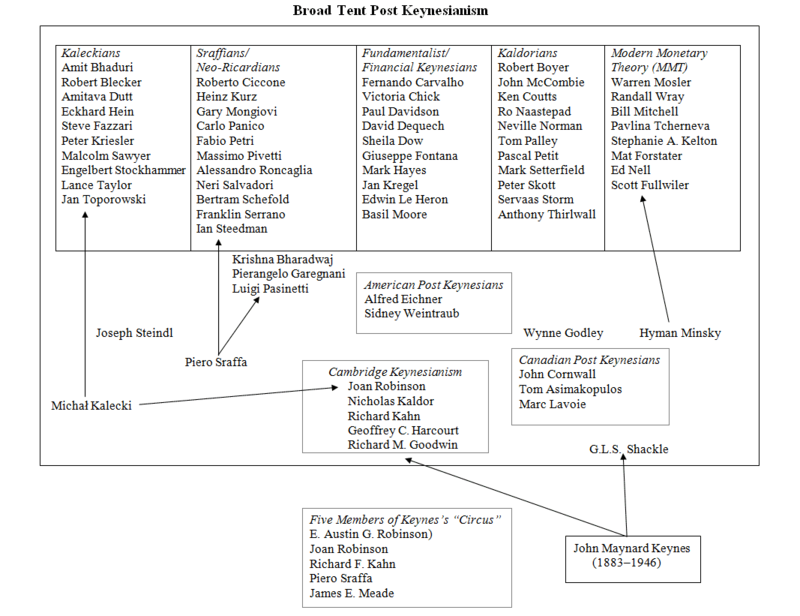 ), with Evsey Domar added to the Early North American Post Keynesians. The third revised diagram, and this time I have added a general line for left libertarian economics, which culminates in the Participatory economics system. The diagram is a revised version of my previous one, taking into account the criticisms and suggestions made. 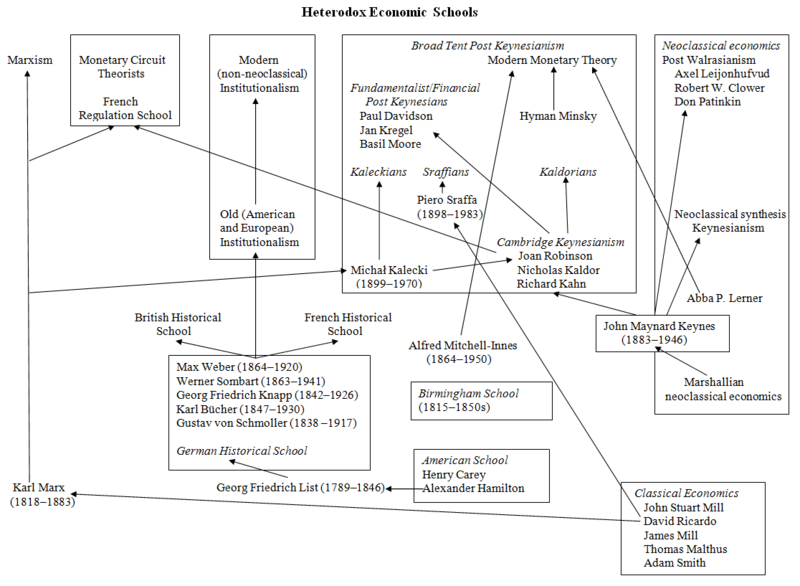 However, the diagram still includes a few neoclassical schools on the right-hand side derived from Keynes for the sake of clarity, and also because I think that Abba Lerner, though he did make contributions to heterodox economics, essentially remained within the neoclassical tradition. While neoclassical theory holds that firms generally set their prices by equating marginal revenue with marginal cost, the reality is quite different. The accounting research literature has provided strong evidence that firms generally use total average unit costs (or full costs or normal costs) as the basis for mark-up price setting (Gordon, Cooper, Falk and Miller 1980; Scapens et al. 1983; Govindarajan and Anthony 1983; Cooper 1990; Emore and Ness 1991; Bright et al. 1992; Shim and Sudit 1994; Drury and Tayles 2000). These results were already known in the 1930s and 1940s (Hall and Hitch 1939) and the “full cost” reality gave rise to the “marginalist controversy” in which neoclassical economists tried desperately to explain away the gap between their theory and reality (Lucas 2003: 203). 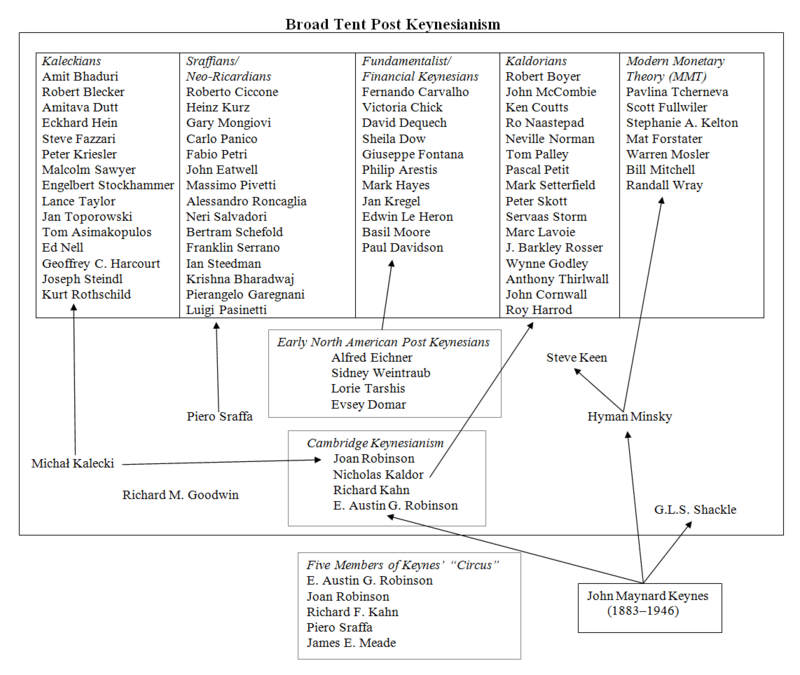 Defenders of neoclassical theory included Edwards (1952), Alchian (1950), Pearce (1956), and Simon (1959). One solution was the doctrine of “implicit marginalism”: the idea that, while firms do not deliberately and consciously equate marginal revenue with marginal cost, in practice they nevertheless act as if they were doing so (Lucas 2003: 203). This was usually related to the methodological instrumentalism of Milton Friedman in his famous essay “The Methodology of Positive Economics” (Friedman 1953), in which Friedman argued that the best test of a theory is whether it predicts outcomes (Lucas 2003: 204), not tests of its assumptions. Both “implicit marginalism” and Friedman’s instrumentalism have provided neoclassical economics with an absurd escape hatch to evade empirical reality. Friedman, for example, claimed to use an empiricist (or positivist) method, but his belief that it is not necessary to test the fundamental assumptions of a theory and that only predictive powers of theories matter is utterly unconvincing. … criticism of this type is largely beside the point unless supplemented by evidence that a hypothesis differing in one or another of these respects from the theory being criticized yields better predictions for as wide a range of phenomena. Yet most such criticism is not so supplemented; it is based almost entirely on supposedly directly perceived discrepancies between the ‘assumptions’ and the ‘real world.’ A particularly clear example is furnished by the recent criticisms of the maximization-of-returns hypothesis on the grounds that businessmen do not and indeed cannot behave as the theory ‘assumes’ they do. The evidence cited to support this assertion is generally taken either from the answers given by businessmen to questions about the factors affecting their decisions – a procedure for testing economic theories that is about on a par with testing theories of longevity by asking octogenarians how they account for their long life – or from descriptive studies of the decision-making activities of individual firms. Little if any evidence is ever cited on the conformity of businessmen’s actual market behavior – what they do rather than what they say they do – with the implications of the hypothesis being criticized, on the one hand, and of an alternative hypothesis, on the other.” (Friedman 1953: 31). There you have it: a theory that claims to explain how a firm acts cannot be tested by asking business people how they act! Now, while it is true that the evidence of econometrics cannot necessarily be used to settle debates in economics, the empirical evidence of direct surveys and case studies has a much greater value than econometric evidence in questions about the behaviour and decision making of firms. The concocted analogy that Friedman gives to try and dismiss the value of empirical surveys here is a ridiculous one. While it may well be that asking old people how they personally account for their long life cannot test scientific theories of longevity, it does not follow that their evidence has no value in testing such theories: on the contrary, one can ask them how they lived and what lifestyles they had in terms of diet, exercise, smoking, drinking etc., which would be highly relevant to such theories. And marginalist theories of price setting can be tested by asking business people whether their decision making and actions conform to the assumptions of the theory and the prior model of what constitutes rational or profit-maximising behaviour. “I do not mean to imply that questionnaire studies of businessmen’s or others’ motives or beliefs about the forces affecting their behavior are useless for all purposes in economics. They may be extremely valuable in suggesting leads to follow in accounting for divergencies between predicted and observed results; that is, in constructing new hypotheses or revising old ones. Whatever their suggestive value in this respect, they seem to me almost entirely useless as a means of testing the validity of economic hypotheses.” (Friedman 1953: 31, n. 22). But this qualification does very little to soften the extremism of Friedman’s position, which, if anything, reads more like the apriorist fantasies of Ludwig von Mises than any empiricist method, in its unwillingness to accept that empirical evidence can refute an economic theory. Assumptions of economic theories (and indeed any theory) matter very much. One could, for example, concoct all sorts of theories with unrealistic and even absurd assumptions that manage to predict outcomes consistent with the observed data, but one must have a criterion for deciding which one is most likely the true and the best theory: here testing the fundamental assumptions of theories is necessary. The empirical evidence of direct surveys and case studies on price setting shows that the marginalist theory of pricing in either (1) an explicit form or (2) the implicit form is mistaken and untenable (Lucas 2003: 207). Bright, J., Davies, R. E., Downes, C. A., and R. C. Sweeting. 1992. “The Deployment of Costing Techniques and Practices: A UK Study,” Management Accounting Research 3: 201–211. Cooper, R. 1990. “Explicating the logic of ABC,” Management Accounting: 58–60. Drury, C. and M. Tayles. 2000. “Cost Systems and Profitability Analysis in UK Companies: Discussing Survey Findings,” Munich. Paper presented to Annual Congress of the European Accounting Association. Emore, J. R. and J. A. Ness. 1991. “The Slow Pace of Meaningful Change in Cost Systems,” Journal of Cost Management 4.4: 36–45. Gordon, L., Cooper, R., Falk, H. and D. Miller. 1980. The Pricing Decision. National Association of Accountants Society of Management Accountants of Canada, Hamilton, New York. Lucas, M. R. 2003. “Pricing Decisions and the Neoclassical Theory of the Firm,” Management Accounting Research 14.3: 201–217. Scapens, R. W., Gameil, M. Y. and Cooper, D. J. 1983. “Accounting Information for Pricing Decisions,” in J. Arnold, R. W. Scapens, M. Y. Gameil, and D. J. Cooper (eds. ), Management Accounting Research and Practice. CIMA, London. 283–306. 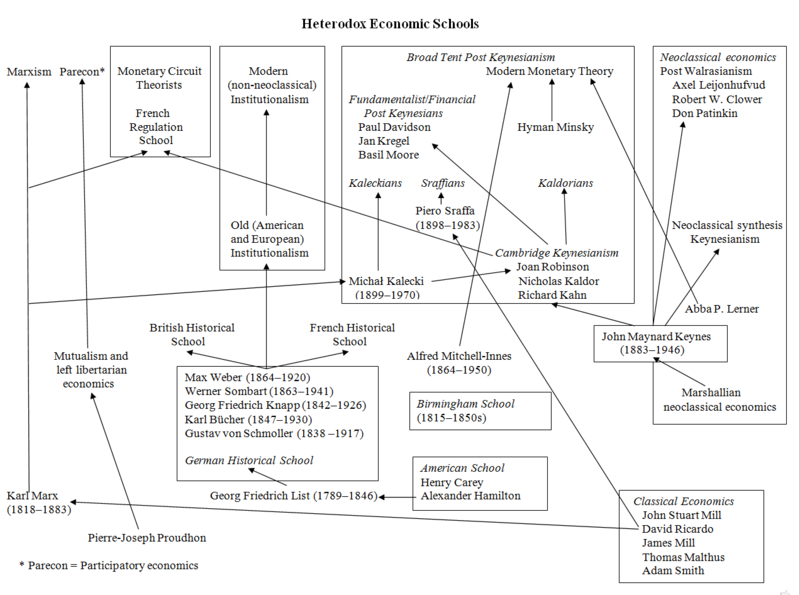 Following on from the last post, I post below a diagram of the left heterodox economics schools. This is a provisional diagram only, since the subject is a difficult one. Once again it needs to be opened in a separate window to be properly viewed. I use the term “broad tent Post Keynesianism” for Post Keynesianism in the broadest sense, incorporating the different sub-schools, as described by Marc Lavoie in his talk below (from 50.37) and this fascinating paper here, with some minor differences: for example, I do not regard MMT as an Institutionalist tradition but within the broad Post Keynesian tradition (I discuss the history of MMT here). 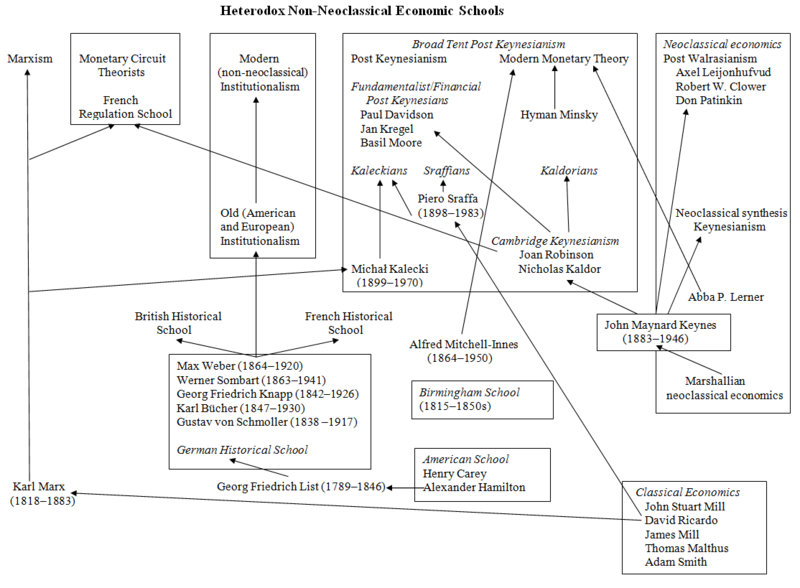 On the extreme right I have included a column with some neoclassical schools for clarity (such as Neoclassical synthesis Keynesianism and Post Walrasianism). I have also chosen to include Abba P. Lerner in that column (which some might find controversial). (8) left libertarian economics such as syndicalism. (9) the 19th century British Banking School. 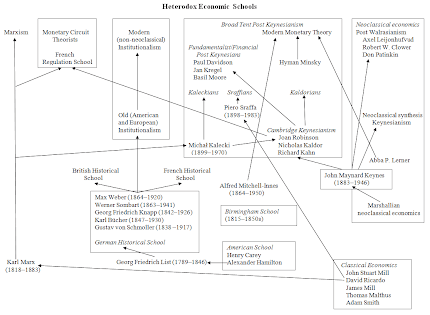 It appears to me that some of these groups are not really coherent economic schools at all (e.g., behavioural economics), and some are still heavily influenced by neoclassical economics. Others I have left out simply because there is not enough room for them on the diagram! 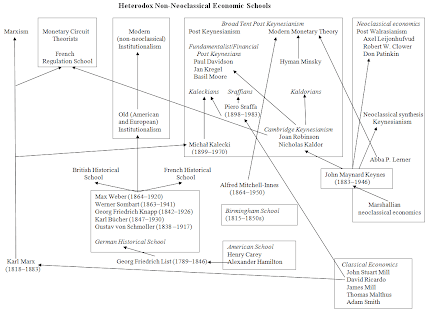 One interesting but neglected historical school was the 19th century Birmingham School, a proto-Keynesian group of economists. “Axel Leijonhufvud and the Post-Walrasians,” May 13, 2011. Davidson, P. 2005. “Responses to Lavoie, King, and Dow on what Post Keynesianism is and who is a Post Keynesian,” Journal of Post Keynesian Economics 27.3: 393–408. Dunn, S. 2000. “Wither Post Keynesianism?,” Journal of Post Keynesian Economics 21.3: 343-366. Lavoie, Marc. 2011. 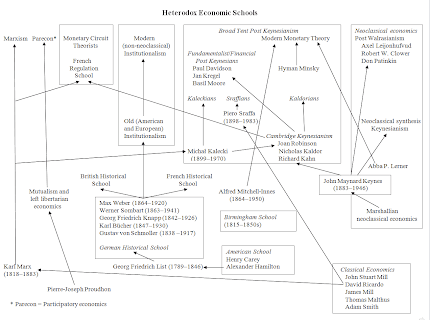 “History and Methods of Post-Keynesian Economics,” in Eckhard Hein and Engelbert Stockhammer (eds. 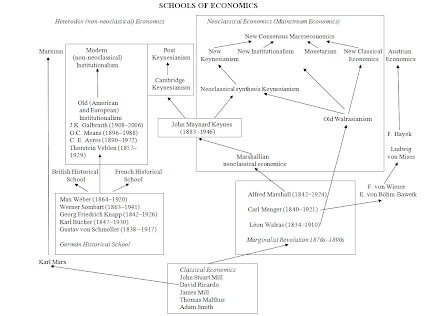 ), A Modern Guide to Keynesian Macroeconomics and Economic Policies. Edward Elgar, Cheltenham.